Many years ago I had breakfast with a friend up in the Black Forest. It was June, and she had made elder cakes (Hollerkuechle in German). For this, you cut fresh elder flowers, dip them into batter and then deep fry until crisp. I liked the fragrant elder flavour, but otherwise wasn't exactly excited, because deep fried baked goods made me even more sick than any other cake or cookie. Meanwhile, I discovered that I don't get sick from gluten free deep fried batter, but I still don't care for deep fried stuff. 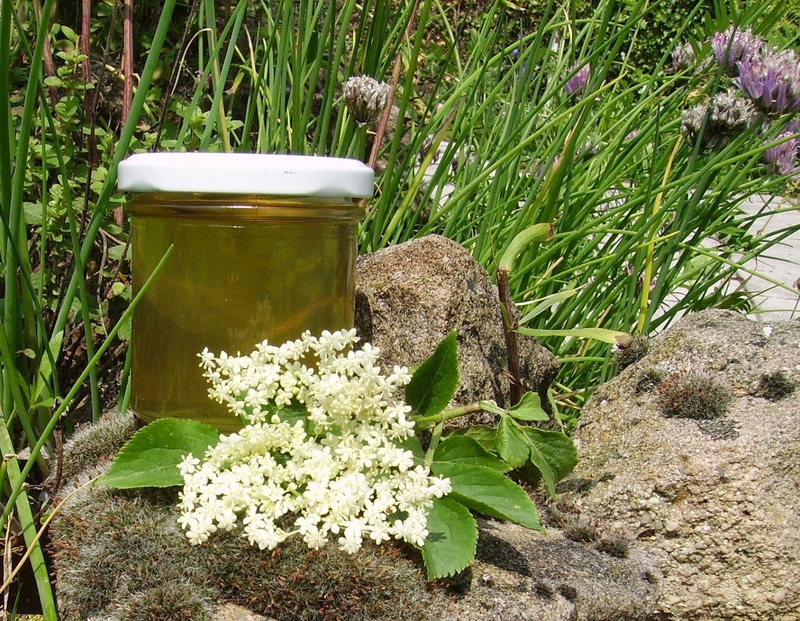 The lovely flavour of the elder flowers stuck with me, though, and so this year, I finally decided to give elder flower syrup a try. 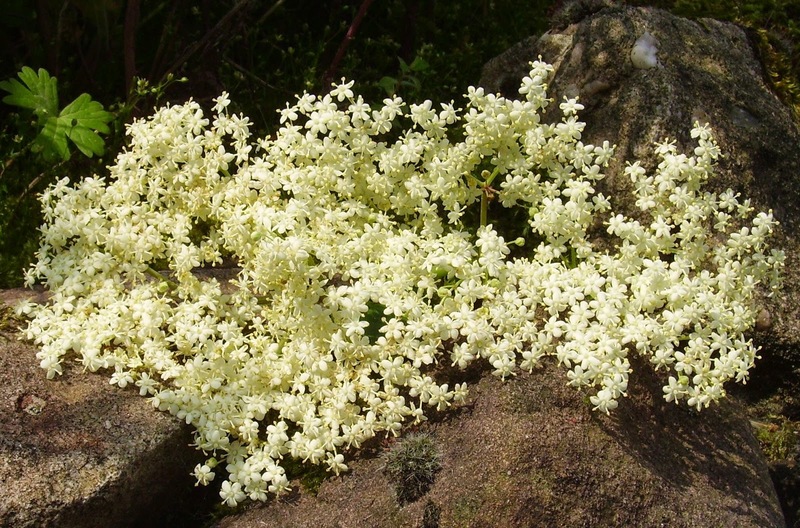 We have an elder tree in our garden, and the whole neighbourhood, including the forest nearby, is full with blossoming elder trees which fill the air with this sweet, heavy fragrance that is typical for the flowers of black elder. 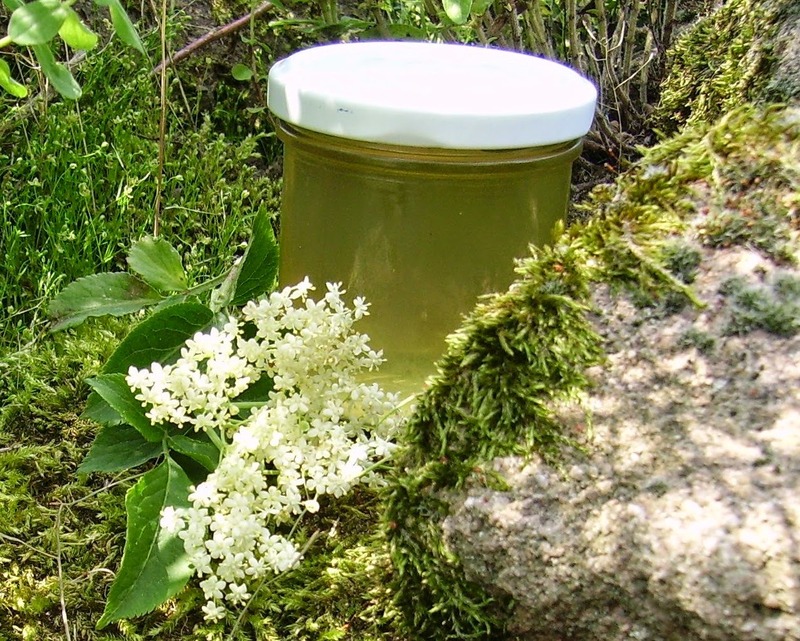 Elderflowers and juice and jelly from the berries are used to cure colds and flus, and scientific studies have proven that elderberry extract is effective in treating influenza B. That might be due to the high content of vitamin C and anthocyanidins (the dark plant pigments) and essential oils. There are many myths around the black elder, such as the belief that carrying an elder twig prevents rheumatism, or that lightening never strikes an elder tree. English and Scandinavian folklore calls the elder-guarding being "elder mother". She's guarding the elder trees, and you better don't take wood or flowers from the tree without first asking for her permission to do so. 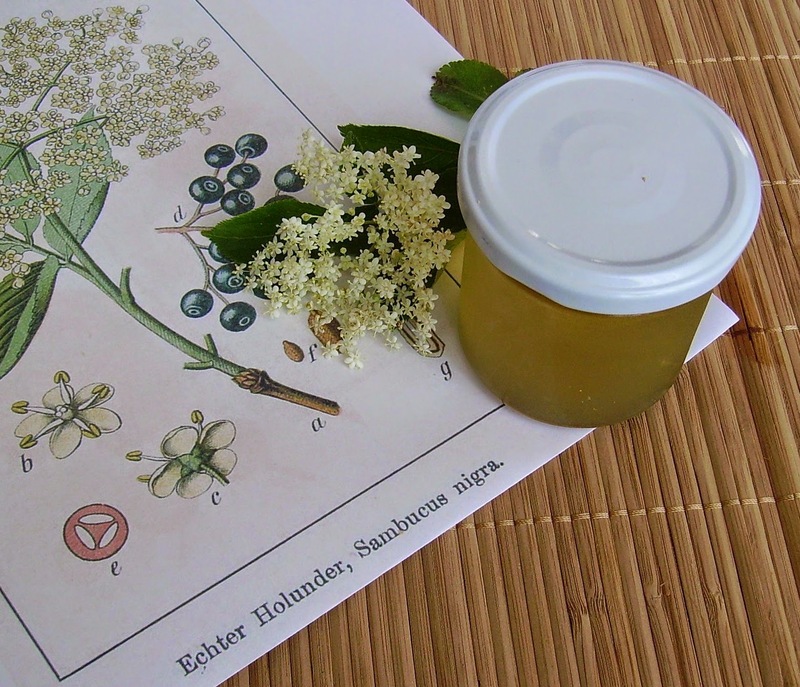 So, go out, find an elder, ask for permission and get some elder flowers to make this fragrant syrup! This is raw syrup; you can boil it after removing the flowers, but I don't find that necessary - after all, you also eat raw fruit. You just have to store the syrup in the fridge so that it doesn't start to ferment, or you'll get some very strong elder flower wine that is most likely to explode at some point. The syrup will last for at least 6 months in the fridge. Just rinse the bottle or jar with boiling water and then let cool before pouring the syrup in. 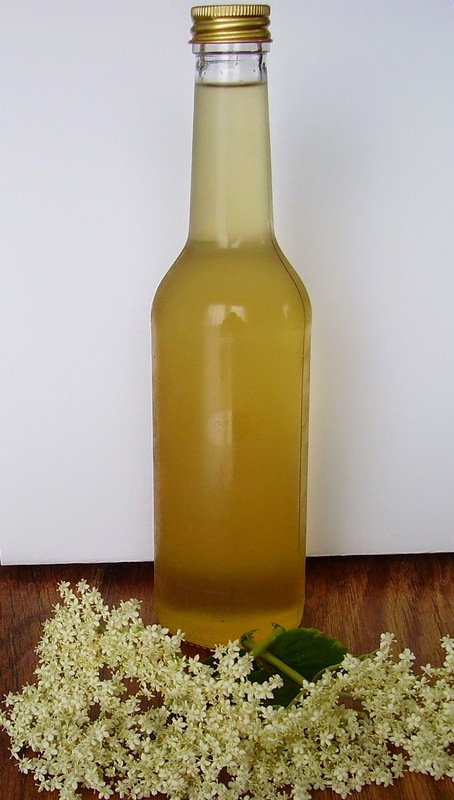 Elder flower syrup can be used to mix with water for lemonade, or mixed with champaign, drizzled over ice cream or cake or which ever way you like to use syrups. 1 glass bottle or jar for 1 1/2 cups syrup. On a dry day around midday, choose a good looking black elder tree. The flowers have to be dry, not wet from rain or dew. Ask the Elder Mother for permission. Thank the elder Mother for her gift to you. Gently shake off any tiny insects that might be on the flowers, but don't wash the flowers. You want the pollen to get the unique flavour. Place the flowers in a glass bowl, cover with the citric acid and the thinly sliced 1/2 lemon. Add 1 cup of filtered water. Let sit on the counter overnight. The next morning, drain the liquid through a sieve, discard the flowers and lemon slices and add 8.5 ounces of light raw cane sugar to the liquid. Stir well and let sit for another 24 hours, stirring occasionally. After about 24 hours, the sugar should have dissolved, and the liquid should be clear. Rinse the bottle or jar for storing with boiling water, let cool, then fill syrup in and store in the fridge. Have you ever made or used flower syrups?